The Graduate Record Examinations (GRE) is a standardized test that is an admissions requirement for most graduate schools in the United States. The GRE is owned and administered by Educational Testing Service (ETS). The test was established in 1936 by the Carnegie Foundation for the Advancement of Teaching. What is the Skills Tested in GRE? GRE is evaluated out of a score of 340. That’s, 170 for Quantitative Reasoning and 170 for Verbal Reasoning.The minimum score that one can get is 260 out of 340. AWAis evaluated out of a scale of 0 to 6 with increment of 0.5 (That means that a student for example can get 4.5 out of a scale of 6). What is the GRE Exam Pattern? Kindly note that there will be one experimental section (either Quant or Verbal) in addition to the above mentioned pattern. However, the scores of the experimental section is not considered but it is not possible for one to know as so which one is an experimental section. What is the GRE Exam Duration? The total GRE exam duration is for almost about 3hrs and 50 minutes. What is the GRE Exam Fee and Eligibility? The GRE Exam Fee for General Tests is $ 205. However, GRE Exam Fee for Subject Tests is $ 150. GRE Scores arevalid for 5 Years. One can submit GRE Scores to how many universities for Free on the day of an exam? One can report GRE Scores to 4 Universities for Free on the day of an exam. For every additional university, one needs to pay $27. How many days does it take for one to receive GRE Official Score Card? It takes about 10-15 Calendar Days for one to receive GRE Official Score Card. 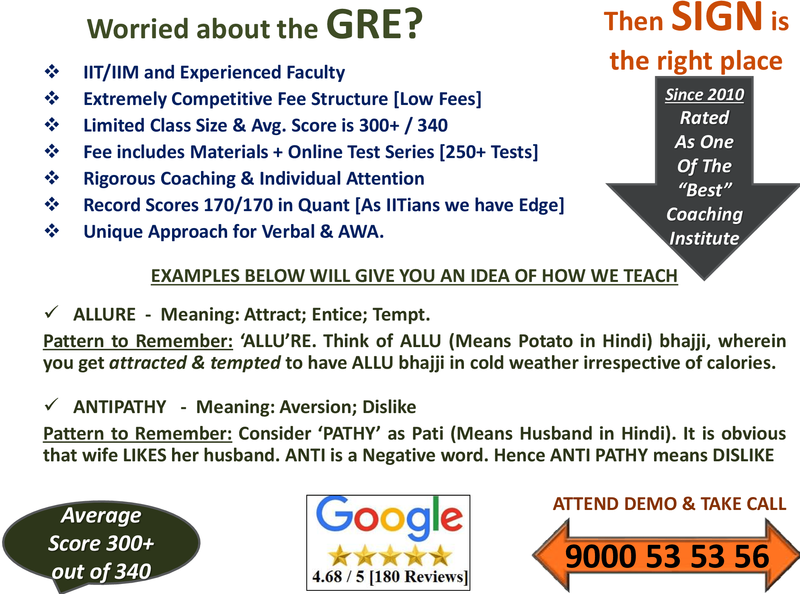 GRE is a Registered Trademark of Educational Testing Service. ETS, Educational Testing Service, and ETS logo are registered trademarks of the Educational Testing Service.